Yoga is an ancient practice for physical and mental discipline that originated in India centuries ago. Today, yoga is practiced by people all over the world, of all ages, and from all walks of life. 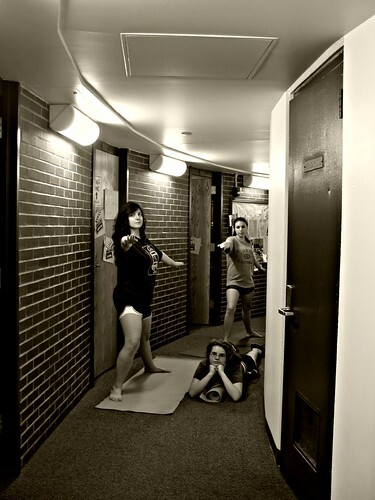 If you’re a college student, yoga is an ideal and easy way to stay in shape and avoid many pitfalls of the college life. Yoga benefits almost all its practitioners, and it may be particularly beneficial for university students. Providing a rigorous physical regime, yoga, when regularly practiced, helps you avoid the infamous “Freshman Fifteen” – the average number of pounds college students gain in their freshman year. Not everyone puts on the same amount of weight, and some students don’t experience any weight gain, but the high-stress environment coupled with the fact that many college students are making nutritional choices for themselves for the first time in their lives means that regular exercise can make a crucial difference to your physical well-being. Because yoga requires that you focus inwardly and become mentally attuned to your surroundings and your body, yoga has been clinically shown to improve mental focus, both in the short and long term. College students may find the added focus extremely helpful for staying on task and excelling at their studies. Regular exercise of any kind can help to improve and even regulate sleep, but yoga in particular, with its emphasis on relaxation, can help significantly improve your sleeping habits. College students often indulge in all-nighters, and may find it difficult to regulate their sleeping cycles, which can cause a loss of concentration and raise stress levels. By getting exercise that emphasizes physical discipline, being in tune with oneself and relaxation, a college student that regularly practices yoga may avoid the constant sleep deprivation that so often plagues many of his or her peers. College life is stressful on almost every level: physically, emotionally, mentally and socially. Add it all up, and many college students get so stressed out by its pressures that they may even burn out altogether. Yoga has been shown over centuries to radically lower and improve its practitioners’ stress levels. Many people who practice yoga look forward to it as an oasis of calm in their daily lives. Yoga can help college students take regular time out to recharge and de-stress, so that they can cope better with the daily rigors of college life. Unlike expensive weights, costly gym memberships or high-priced dieting fads, practicing yoga is absolutely free. You can find many free programs, videos and tutorials online, and if you want to purchase yoga programs on DVD, these are often much cheaper than other kinds of exercise. You can practice it anywhere, even in your dorm room. An experienced yoga teacher can help you with proper form and posture, but professional yoga classes can often be purchased for only a few dollars per class at gyms and yoga studios. Many colleges even offer yoga classes led by trained professionals right on campus. A college student’s life is full of stress and hard work, and is often out of balance. Yoga is the ideal fitness practice for college students looking for a proven, low-cost holistic approach to health management. Kathy Schwarz is a career counselor and in her spare time she blogs for topcollegesonline.org, a site she often recommends to those who are interested in finding out more about which are the best online colleges.